Bishu Prusty (BP): Veda Narayan Sir, you said you came to Bhagawan in 1968. In fact you mentioned that this is the 36th Dasara celebration that you have been fortunate to witness and participate (October 2012). So how was the celebration in the '70s? Veda Narayan (VN): Amazing days! Dasara and Swami's birthday were much looked forward to. The ten days of Dasara were especially incomparable. On the first day the procession used to gather and Sai Geetha used to take the lead. Swami used to come out wearing a long garland. There used to be an umbrella just like how they hold something whenever a royal person walks. Another person used to carry the fan, which is called chaamara (yak-tail fan). BP: It was a king in the procession. 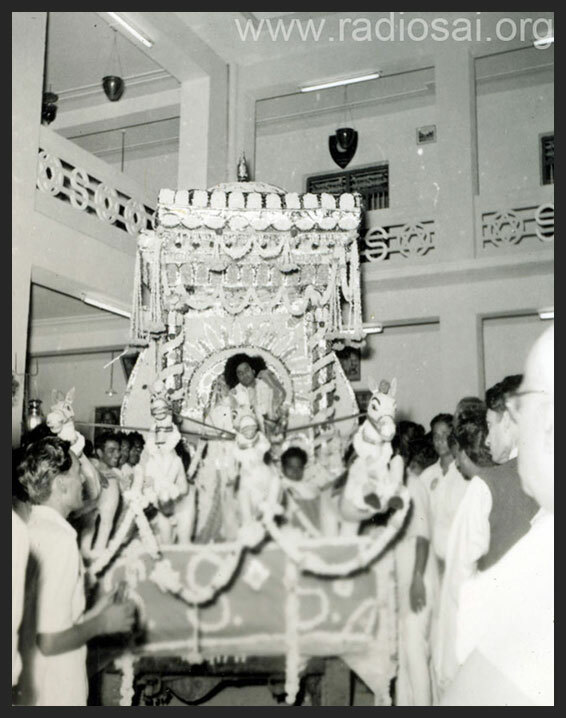 VN: Not only that, in those days ladies like Peddabottu Amma and others used to beautifully decorate the entire pathway along the area from Swami's interview room onwards till Poornachandra Auditorium. They would make a carpet of flowers for Swami to walk on. They used to work from early in the morning. Swami used to royally walk on that carpet. Once He came to the Poornachandra Auditorium He used to spend hours together there. In fact He used to come and sit on the floor. Initially in the Poornachandra Auditorium you could directly climb onto the stage from the middle pathway itself and Swami used to sit in the middle on the pathway. Many times He used to walk till the end in between devotees, collecting letters and so on. He would go on all the three sides: gents' side extreme, ladies' side extreme and even the middle. Then around 10 or 10.30 a.m. He would go on the stage where the main kalasha was kept. The pundits used to stand on both sides and chant Mantra Pushpam and then adorn Swami with a beautiful garland. Oh God! I know for sure that each and every God would be present then to see the glory of the Lord. How Swami used to sway when they used to chant! All the devotees would be overjoyed to watch that wonderful scene. Swami used to wait for the pundits to finish the procedures and then return. In those days the entire day and night was filled with activities. The yagnam used to finish around 11.30 a.m. and by 1 p.m. everybody used to assemble back in Poornachandra Auditorium because there used to be Hari Katha Kaalakshepam in Telugu by the group from the Vidwan Maha Sabha. They used to narrate beautiful stories about Sri Rama Pattabhishekham and Shri Krishna Tulabharam and so on in the form of songs and narration. This used to go on till 3 p.m.
By 4 or 4.30 the Vidwan Maha Sabha would take place where great Vedic scholars like Chandramouli Sastry for whom Swami gave the vision of Anjaneya, Kuppa Bairagi Sastry, Ghandikota Subramanya Sastry and Sri Kamavadhani spoke. These scholars addressed Swami as Paramatma Himself; that was their faith. In response to the questions they posed during their speeches Swami would give the answers in His discourses that followed, which used to get over around 6.30 p.m. After this Swami used to go to the mandir and return by 8 p.m. and then there would be a cultural programme. There were days when the programmes went on till midnight. It was indeed Navaratri in the true sense — through the night. The whole day and night was filled with activities. BP: Fantastic! Bhagawan in a discourse during that time mentions about the purity of these priests. He says that the priest performing the Sahasra Lingarchana which used to go on till 2 p.m. in the afternoon would never move till he completed it. VN: Just to mention about the Sahasra Lingarchana, I was asking the priest about it. Every day there is a particular mud he has to go to an anthill and collect. Also I think he has to chant 21 times of Rudram and make 1008 Shiva Lingas. For each Lingam he has to put one grain of rice, arrange it in a particular fashion like a Shri Chakram and then do abhishekham. SK: The Shodashopachara puja (16 steps involved in a puja) also. VN: Yes, for each lingam. So he starts in the early morning around 2 o'clock and finishes in the afternoon around 2 o'clock. VN: Till then he doesn't even take a sip of water. BP: No wonder Swami praised the purity of these priests. VN: Such dedication! In fact the previous person who was doing the Sahasra Lingarchana was so emaciated but for the energy he had I'm sure Lord Shiva Himself would have appeared before him and granted him liberation. This is tapas or real penance. They leave everything and are totally dedicated. No amount of money in this world can buy this. SK: Every day Swami used to go and inspect the Sahasra Lingarchana and appreciate the person doing it. This person used to be in one corner of the Poornachandra Auditorium. Swami used to wait and watch what he was doing. That was the amount of concern that Swami showed regarding each and every aspect. In fact so many things happen on stage. BP: Yes. Not everyone is aware of the different things that happen on stage. You only know that there is the main Yagna Kundam and that the yagnam is happening but there are groups of people in every corner of the stage. Maybe you can share about what really happens in the different sections of the Poornachandra Auditorium. VN: On the right towards the ladies side the first thing is the Sahasra Lingarchana which goes on. Next to that is the main Devi Kalasham, which represents the Goddess. 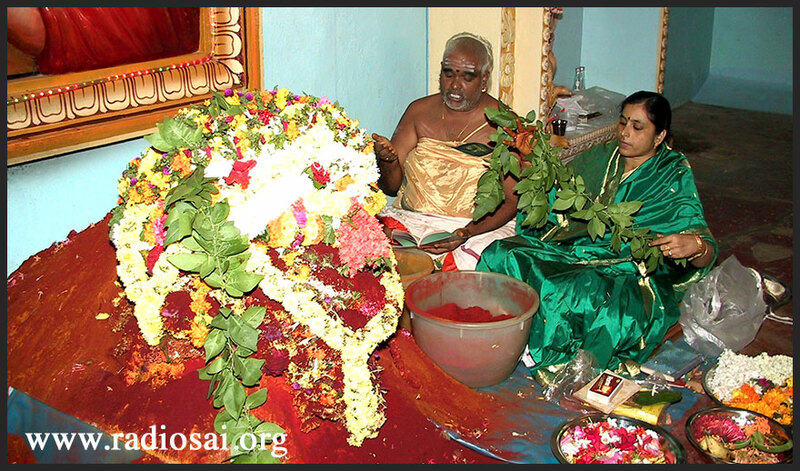 The priests chant Lalitha Sahasranamam, Lalitha Trisathi, Lalitha Ashtothra Shatanamavali, and Khadgamala and do Kumkum Archana along with the Shodashopachara puja. Then Devi Mahatmya Parayanam is done by the priest himself. When you come towards the middle of the stage on the right side there is a group of 4-5 people. They are expected to finish chanting the entire Krishna Yajur Veda in 7 days. Sometimes they will not be able to finish and so they sit in the afternoons or even in the evenings because before the seventh day they must finish the entire chanting. SK: When you hear them, you realise they are chanting quite fast. VN: Yes. You can see the vastness of the Vedas. BP: And this is only a very small percentage of what is actually bequeathed to us; we have lost a lot. VN: Not only that, they don't refer any book but just chant from memory. That is amazing! Then in the middle of the stage you have the Rudra Homam where the priests chant Namakam and Chamakam as Ekadasa Rudram every day. Then towards the eastern side you have a person doing the Surya Namaskar. In the usual Surya Namaskaram procedure they chant the entire Arunam and go around the lamp. 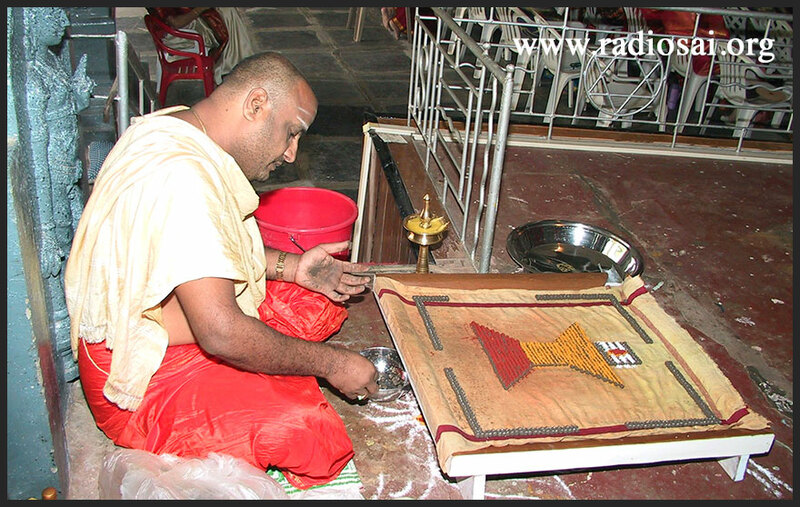 They prepare a Surya Narayana Chakram around which they do pradakshinam and then namaskar. These people had the great good fortune of directly falling at Swami's feet while doing pradakshinam when He came onto the stage. 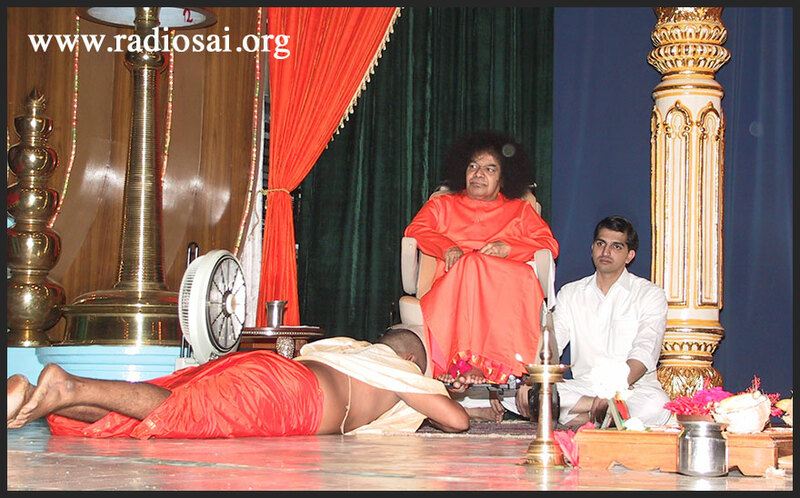 The namaskaram has to be done in a particular way and Swami used to wait till they finished. Just imagine! Lord Sun Himself has appeared before them and is standing there in full glory. BP: I remember the days when the priest who was doing the Surya Namaskar had the really unique privilege of circumambulating around the physical frame of Bhagawan. VN: The flower used to worship Lord Sun is the red lotus and this priest used to hand over the red lotus to Swami. I used to pray, “How I wish I get a chance like that!” There was another person whom I saw only for a few years. He was heavily built and he used to do a Surya Namaskar which I've never seen anywhere. He used to fold his right leg and then stand only on his left leg. He would raise both his hands above his head and would never move from his place. Then he would directly fall on the floor, do the Namaskar and then get up. SK: This Namaskar was also done during the Sahasra Poorna Chandra Darshana Yagnam. VN: Yes, you are right. Imagine this man who is heavily built with his body weight standing on one leg and raising both his arms till he completes all the Namaskars. This is what is called penance! SS: I think they also do 108 Namaskars every day. SK: 130 plus per day! BP: Wow! So there's a lot that goes on. SK: Then on the side there is also Sundara Kandam chanting. VN: Yes. They have Ramayana, Bhagavatham and Devi Bhagavatha parayanams happening simultaneously on the stage. Swami has also given our students the great good fortune of doing Devi Mahatmya parayanam and I find that many boys are taking interest. Mind you, this is no ordinary thing because these children come on empty stomach in the early morning. For newcomers the parayanam takes 4 to 5 hours. Today I saw around 50 children sitting on the stage and doing Devi Mahatmya Parayanam. SS: This time there were nearly 60. BP: Shashank, you should tell us about what goes on in the hostel. SS: Yes. This time there are 59 students and I had the opportunity of co-ordinating this. In fact Veda Narayan Sir himself had initiated us to do the Devi Mahatmya Parayanam when I was in second year MBA. Our former Registrar Lakshminarasimhan Sir had taken Swami's permission in 2003. He prayed, “Swami, boys want to do something for you.” So Swami had given permission for us to do Devi Mahatmya parayanam. It started in 2003 and this is the 10th year now (in 2012). Steadily the number has been increasing every year and this time we have about 59 students from all the men's campuses of Brindavan, Prasanthi Nilayam, and Muddenahalli, including the Higher Secondary School. So the 10th, 11th, and 12th class students along with the undergraduate, post-graduate, MBA, M.Tech., and even Ph.D. students in addition to some of the teachers do this parayanam. BP: I don't think it would be happening in any other University in the world! SS: You won't find anywhere MBA and M. Tech. students getting up at 3 in the morning, having bath, wearing dhoti and angavastram and rushing to the yagnashala for doing Devi Mahatmya parayanam. SK: Some of these students are so eager that along with Devi Mahatmya parayanam they also want to come for Grama Seva. SK: They want to finish the parayanam before 7.30 a.m. and so they start very early in the morning around 3 a.m. 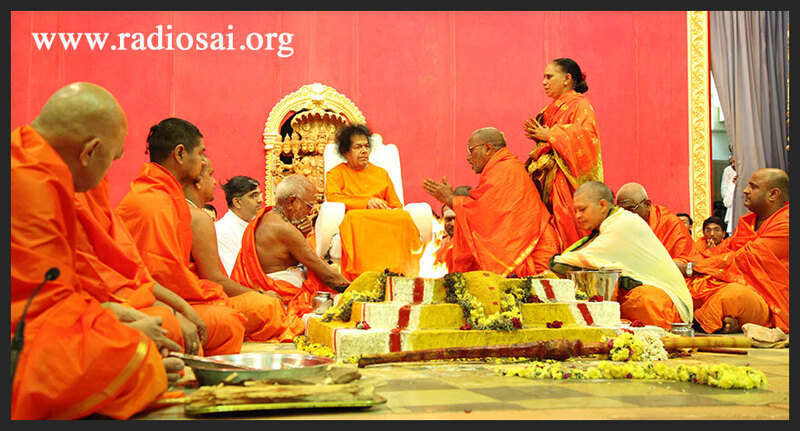 They finish the parayanam and then join in Grama Seva. That's the amount of enthusiasm they have. SS: The Devi Mahatmya is a very long scripture as Veda Narayan Sir was saying. There are 700 verses. It is called Durga Saptashati where Sapta is seven and Shati is 100. These verses glorify the Mother Goddess and all the occasions where she destroyed and vanquished the demons in order to uphold righteousness in different forms. She killed demons like Raktabija, Dhumralochana, Chanda, Munda, Sumbha, Nisumbha and of course Mahishasura. Each chapter is dedicated to how the demon was destroyed. BP: I think they are all very symbolic. SS: Yes. In fact Veda Narayan Sir was telling us that the description of each fight is actually a code or a mantra in its own way because the syllables have their own unique potencies. VN: There is a lot concealed there. For a person who is reading in a vague way it's just a question of some fight going on like the Mahabharata war. But in each of these verses if you take the first letter you'll find some Beejaksharas which will lead to a beautiful mantra. These are all encapsulated. The more and more you do it, it will come more as a revelation to you. BP: How did you get initiated into Devi Mahatmya, Sir? VN: It was way back in the '80s. That was the time when we were just learning Vedas. Whenever these Pundits used to come, we used to dream and wonder whether there would ever be a day when we could also wear the orange dhoti and sit on the stage. BP: You are doing it now! He said, “Fine, we will do it.” We started making enquiries on how to do the parayanam. Somebody said that we cannot do it just like that unless somebody initiates us into the mantra. At that time Sri Padmanabha Sastry used to be in charge of the Devi Mahatmya Parayanam here. SS: Just to add to that, there is a Poorvaangam and Uttarangam (verses to be chanted before and after). VN: Yes. The Navangam is there, which itself takes about one and a half hours. SS: It's almost double of 700; its 1400 verses. My God! That was the ultimate bombshell he gave — go to Swami and get initiated. But what he gave as a suggestion we took up really seriously. We wrote the mantras and kept it in our books. We thought we'd ask Swami if at all we got a chance whether we can really do it even without initiation. That was our idea. So we went and sat for darshan. I said, “Yes Swami.” He said, “Happily do it” and closed the book and handed it to me. He took the book from the other boy also. He opened the book, saw the mantra, kept it back and gave the book to the boy. BP: It was direct initiation!